We’ve got all of the fun ideas you’ll need to pull off the best Cinco de Mayo fiesta of all time! My all-time favorite food is Mexican food. I could eat chips and salsa for days! Cinco de Mayo is a great excuse to make all of your favorite Mexican dishes and throw a big fiesta with all of your friends. Who doesn’t love an excuse to party?? Chips and salsa are great, but chips and salsa with friends is even better. It wasn’t hard to round-up the most delicious and bright Cinco de Mayo ideas to help you pull everything together at the last minute. 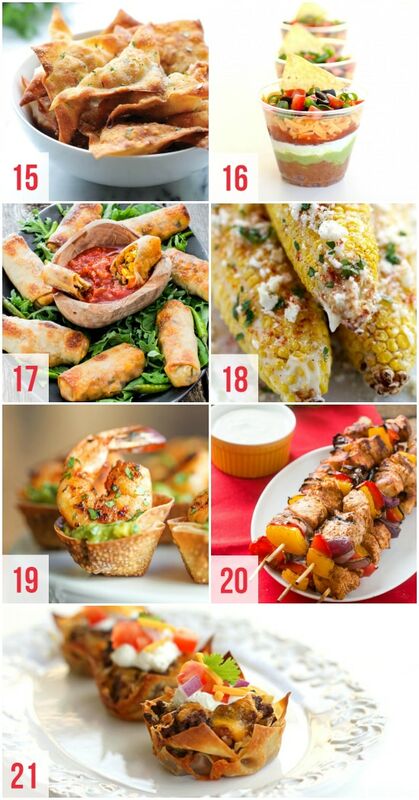 When it comes to Cinco de Mayo ideas, we have found them all! 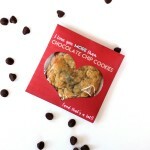 This round-up literally has everything you need from food to crafts and activities for the littles. 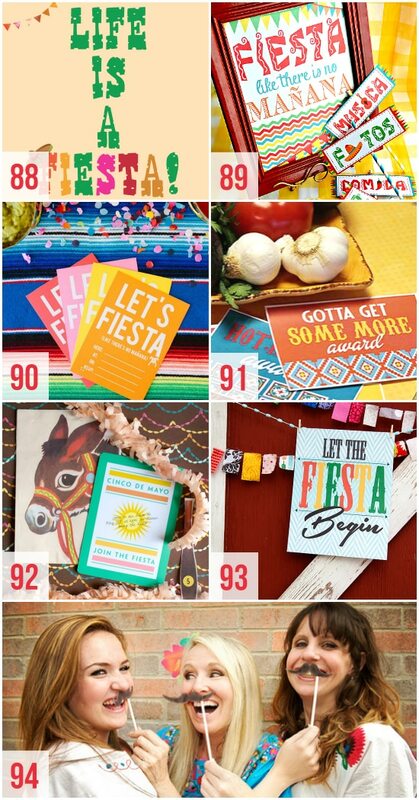 We’ve even found some easy decor ideas to spice up your party space… and of course, printables to make your fiesta look like you put a lot of time and effort into planning and preparing (but they really are so easy to print out and set up). Are you ready to start browsing?? 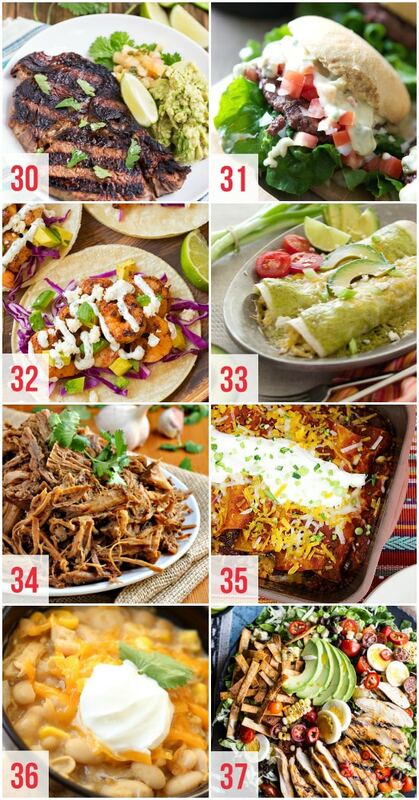 Let me just warn you–your mouth will water and you might be really hungry for some Mexican food by the time you hit idea #9! Guacamole gets me every time! 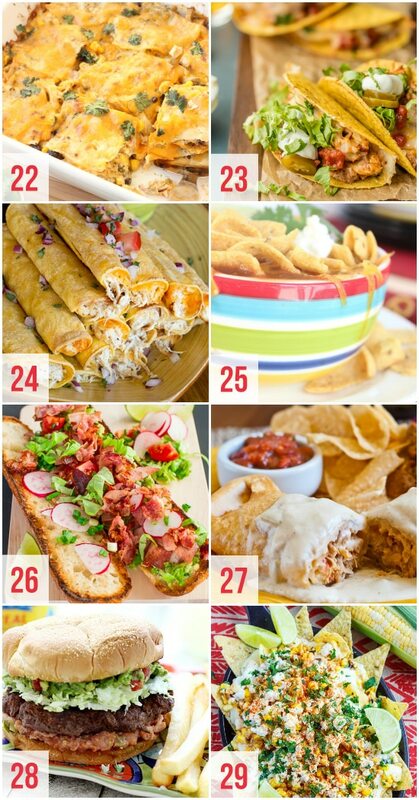 Everyone looks forward to party appetizers, so there is a lot of pressure to have delicious, mouth-watering appetizers to get your guests excited about the rest of the fiesta! We believe we’ve picked out the best of the best! 1. Watermelon Skewers – Festive skewers + fresh watermelon paired with delicious and stylish flavors! 2. Chips and Salsa – A classic and, honestly, everyone’s favorite! Chips and salsa are a crowd-pleaser for any fiesta! 3. Strawberry Mango Salsa – Want a sweeter take on chips and salsa? Add some strawberries and mangoes. Oh, wow! 4. Strawberry Pineapple Agua Fresca – Every party needs a drink! You’ll love this sweet and tangy Agua Fresca. 5. Horchata – Go all out and make your party REALLY authentic with this homemade horchata. 6. Mini Taco Stuffed Bell Peppers – Mini bell peppers stuffed with taco meat can be prepped before a party. Everything is cuter when it’s mini! 7. Chicken Enchilada Dip – You can fill this dip out with your favorite enchilada fillings. I like to go with some healthier ingredients, including corn and beans, before moving on to plenty of cheese! 8. Chicken Enchilada Verde Dip – This finger-licking-good dip will have you grabbing a spoon instead of chips! 9. Loaded Guacamole – My all time favorite dip, loaded with all kinds of flavor! YUM! 10. 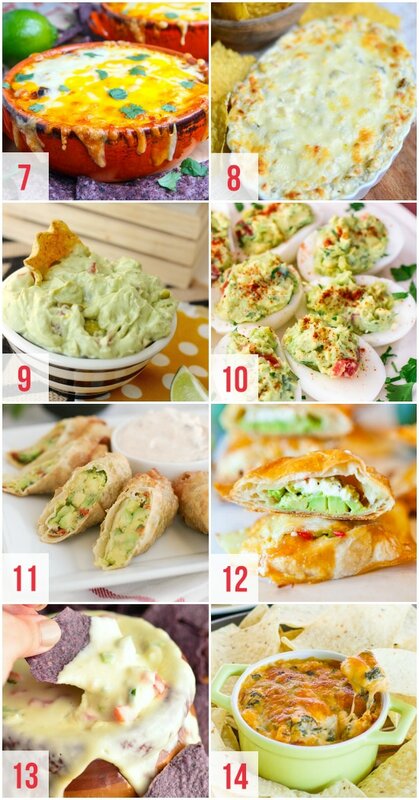 Guacamole Deviled Eggs – Make a platter of deviled eggs! They are a perfect party appetizer. Make them even more flavorful (and healthier) with some guacamole. 11. Avocado Egg Rolls – I’ve only had this appetizer at a restaurant and it was delish! Now I can make it myself for our very own fiesta! 12. Avocado Puff Pastry – My mouth is watering over these pastries filled with creamy avocado goodness. 13. White Queso Dip – Who doesn’t love Queso dip? 14. Baja Spinach Dip – Hot, cheesy and spicy! The kick in this dip will have you begging for more. 15. Southwest Wontons – I’m a sucker for all things fried, crispy, cheesy, and delicious. These wontons are so easy to whip up! 16. 7 Layer Dip Cups – These seven layer dip cups are individually portioned and perfect for a party! No double dipping!! 17. Spicy Baked Mexican Eggrolls – Wrap all of your favorite Mexican ingredients up in these delicious, spicy, baked, Mexican chicken egg rolls. 18. Mexican Street Corn – Hello golden kernels of deliciousness covered with creamy garlic sauce, drizzled with lime juice, and rolled around in cheese and cilantro. You had me at hello! 19. Guacamole Shrimp Wontons – Your life will never be the same again. Cajun shrimp and guacamole in crispy wonton cups are the perfect fiesta appetizer. 20. Grilled Chicken Fajitas on a Stick – Everything is better on a stick! 21. Taco Cupcake – Yummy layers of your favorite taco fillings baked in wonton wrappers. Sounds amazing right!? Looking for some easy Mexican dinner ideas to feed a crowd? There is something here for everyone… Traditional Mexican dishes and some unique twists on some Mexican favorites! 22. Fiesta Chicken Enchiladas – This enchilada casserole is full of flavor and so good for you… everyone at the party will thank you! 23. Baked Spicy Chicken Tacos – Super easy and ready in 30 minutes! 24. Cream Cheese Chicken Taquitoes – Finger food is the way to go! Grab a taquito and let the fiesta begin! 25. Taco Soup – Such a hit in my house, everyone loves it! 26. Mexican BLT – I’m all about making bold and flavorful moves! Push the boundaries a little bit and try something new! 27. Chicken Chimichangas – We just had to find a killer chimichanga recipe to spice up your party. 28. Queso Blanco Cinco De Mayo Burger – Looking for a twist on your Cinco De Mayo menu? This is it! 29. Mexican Street Corn Nachos – These nachos are loaded and everyone will love the massive amount of flavor in these street style nachos! 30. Grilled Margarita Steak – All of the best flavors in this steak… lime, cilantro, garlic, hooked yet? 31. Tijuana Burger – Mix it up with a stellar burger inspired by Mexico! 32. Shrimp Tacos with Cilantro Lime Marinade – Now we’re talking! These shrimp tacos are almost too pretty to eat! 33. Avocado Cream and Chicken Suiza Enchiladas – Oh, these creamy chicken enchiladas make me happy and the avocados make this dish absolutely gorgeous! 34. Slow Cooker Carnitas – Carnitas are a classic dish that can be eaten in a variety of ways. This recipe can be prepped in 10 minutes. 35. Beef Enchiladas – Another classic dish done right! Load these beef enchiladas up with your favorite salsa and guacamole and you’ll be in fiesta heaven! 36. Creamy White Bean Chili – This creamy, white bean chili is a little different than the normal Cinco de Mayo entree! It’s delicious and flavorful… even the kids love it! 37. Grilled Chicken Cobb Salad – For those who want to be a little healthier… this salad has got it going on! It definitely meets the requirement of being colorful! I decided that I was going to throw the ultimate Cinco de Mayo party after finding all these delicious desserts. Heck, I’ll just make some of these Mexican desserts for fun!! 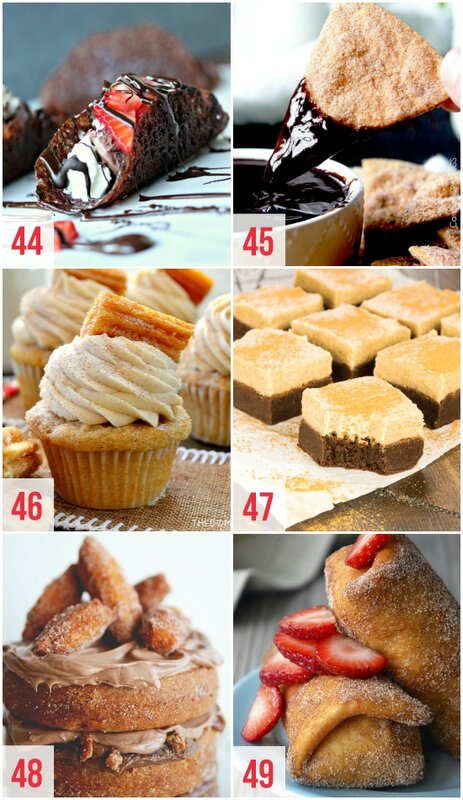 How many ways can you make a churro?? I’m on a mission to find out! 38. Mini Tres Leches Cakes – When I think Cinco de Mayo, I think tres leches… These mini tres leches are made in ramekins and they are moist and delicious with a sweet whipped topping and smothered in strawberries. 39. Sombrero Piñata Cookies – Super cute candy filled sombrero cookies! These look so cool! 40. 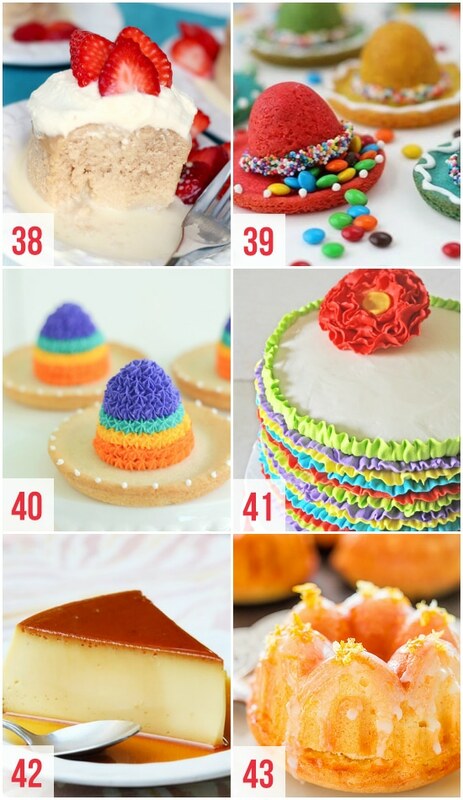 Sombrero Cookies – These sombrero cookies are super fun to make and very bright and colorful! 41. Fiesta Ruffles Cake – This cake is everything you want from a dessert– fun, colorful, and sweet! 42. Easy Flan – A unique, delicious custard will be a treat for everyone! 43. Margarita Cake – Moist, delicious, tangy, unique… oh, and easy, too! This recipe uses a cake mix and turns it into a masterpiece that will stun your party people! 44. Chocolate Tacos – Who could say no to these? 45. Churro Chips and Chocolate Dip – Churro chips are magically transformed from flour tortillas, dusted with cinnamon and sugar, to a MEGA YUM that you won’t be able to stop munching! 46. Churro Cupcakes – Moist cinnamon spiced cupcakes, luscious buttercream, and a delicious, crispy, baked churro. 47. Mexican Chocolate Brownies – There are so many unique desserts, but this one touches close to home – no one can resist chocolate! 49. Strawberry Cheesecake Chimichangas – If you didn’t get enough chimichanga for dinner, there is always dessert. What could be better than fried cheesecake for dessert? 50. Angel Foodcake Churro Bites – Super easy dessert that will wow your friends and family. These bites are a little bit of heaven. 51. Dulce De Leche Churro Donuts – Wow! Good call combining my favorite things: fried bread and caramel! 52. 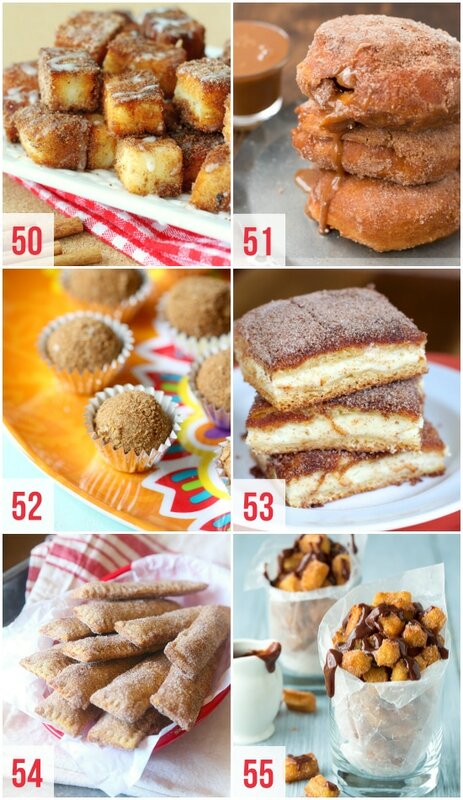 Churro Truffles – How many ways can you make churros?? You have got to try these truffles. 53. Churro Cheesecake Bars – Mmmm. Combining cheesecake with churros is a genius idea. 54. Dulce de Leche Churro Sticks – These would be so pretty on a dessert bar. Oooh! I can’t wait to try this recipe out. 55. Churro Bites – Keep it simple with these amazing churro bites. Everyone gets their own little cup of cinnamon-sugar goodness! This is the one area that I always get stumped when it comes to party planning! 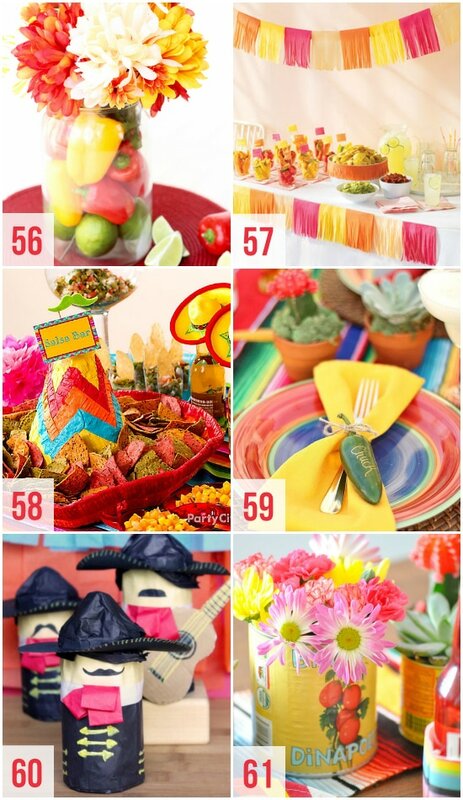 I cannot even believe the simple and clever Cinco de Mayo decor ideas that you can do in minutes. 56. Peppers and Flowers – Bright colored peppers make a beautiful centerpiece. 57. Fringe Banner and Decor – This would be great to brighten up your dinner table for Cinco de Mayo, or any holiday! So pretty!! 58. Tortilla Chips in a Sombrero – A cool and clever way to serve tortilla chips at your Cinco de Mayo fiesta! 59. Party Pepper Name Tags – Grab some bright napkins to pair with a fancy name tag for your party on a pepper! 60. Mini Dancing Piñatas – These make a fun table decor, and kids will have fun playing with them later! 61. Flowers in a Can – This is an amazing way to reuse cans and display flowers for a bright and fun table setting! 62. 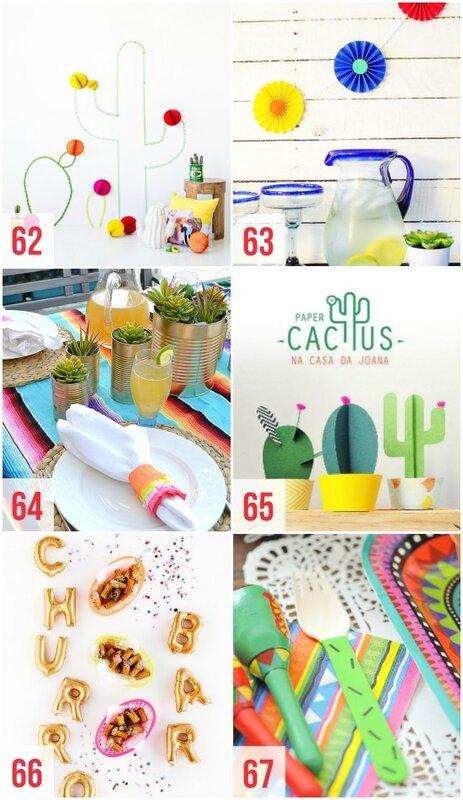 Washi Tape Cactus Wall – Now this would be a cool backdrop for Cinco de Mayo pictures! Grab some washi tape and be clever. 63. Pinwheel Decor – These pinwheels make for a fun and easy pop of color to the party! 64. Pinata Napkin Rings – Brighten up the table with these fun tissue paper napkin rings! 65. Paper Cactus – This is an easy DIY paper cactus that you can use to decorate anywhere and will still look great after the fiesta is over! 66. Churro Bar – This gives so many ideas for how to throw a party centered all around the delicious churro! 67. Painted Cactus Forks – These painted wooden forks would be so simple to make and would add an element of fun to your fiesta table! 68. Papel Picadel Banner – Now these are just cool. Use crepe paper to make festive and vibrant decor. 70. 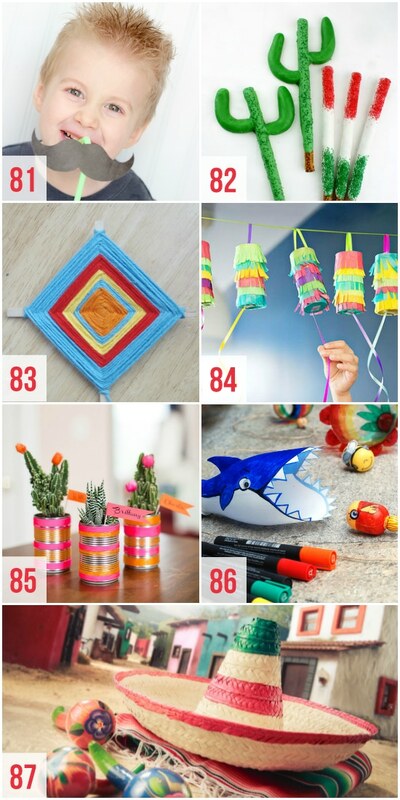 Mini Cactus Piñatas – Check out these cute little piñatas made from toilet paper rolls! 71. Avocado Piñata – Okay. 3 words. Giant Avocado Piñata! 72. Sombrero Hats on Chairs – Everyone loves a fun sombrero, try using them as decor! 73. DIY Crepe Paper Flowers – All you need is a little tissue paper to make these crepe paper, tissue flowers! They are big, bright and beautiful! You’ve got to check out the fun Mexican games below! 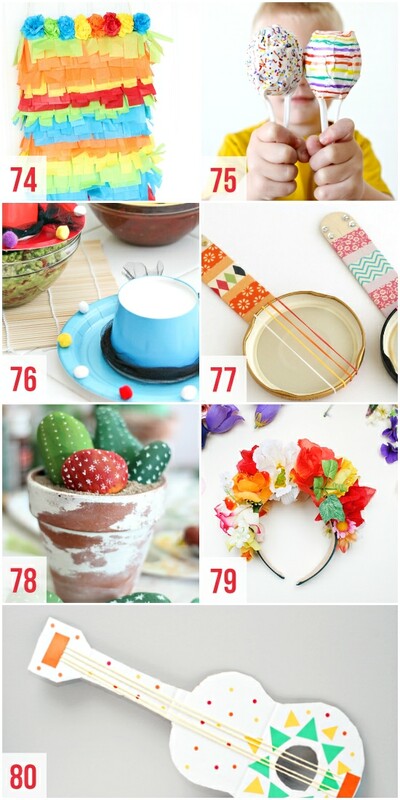 There are also several ideas for making your Mariachi band instruments and so many more fun activities for the kids, and adults, at your party! 74. DIY Cereal Box Piñata – Throw this DIY piñata together for a fantastic party! 75. DIY Kid Maracas – This is an easy project! Once the kids have made their maracas, they can start up their own musical band! 76. Paper Plate Sombrero – An easy project that kids can add their own little flair to. Don’t forget to snap a pic when they’ve finished up their sombrero! 77. Mini Lid Banjos – How cool are these mini instruments? Play along with the fiesta music using your own mini banjo! 78. Painted Cactus Rocks – Anything involving paint makes my kids giddy! Just find a few rocks and let the kids go at it… The end result will probably surprise you! 79. Flower Crown Craft – If you have any girls at your party, you must put together these adorable, floral headbands. 80. Mariachi Guitar – Add to your kid’s mariachi band by making and decorating these fun guitars! 81. Silly Mustache Straws – Okay now, this is just silly. But it’s super fun and would make for a great photo op! 82. Cactus Pretzels & Cinco de Mayo Strawberries – This would be a fun activity to do with the kids that could double as a dessert. 83. Ojo De Dios Craft – I remember making these in school. Learn a little about the culture and make something that the kids can admire in the future! 84. 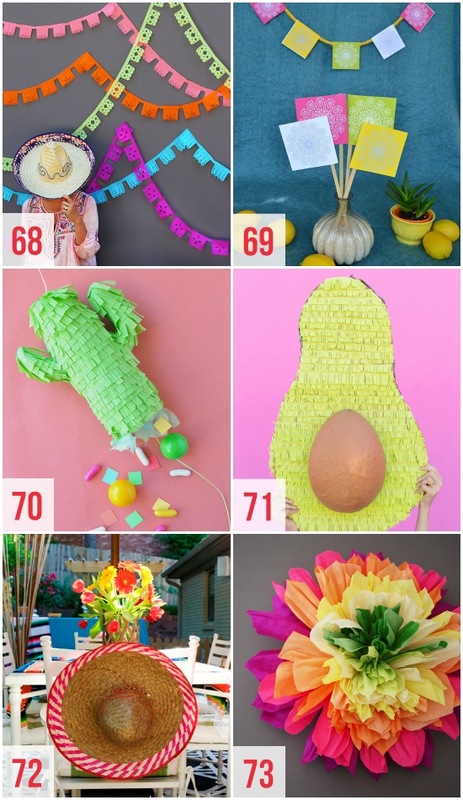 Pull Open Piñatas – If you want to be nominated for parent of the year, you’ll want to make sure these are on your party plan! If you want to be nominated for spouse of the year, try our Love Piñatas! 85. Mini Cactus Cans – It is truly amazing how you can transform a plain old can into a neat little craft. It’s time to pull out the craft supplies! 86. Balero – This is a fun craft that turns into a game and will entertain the kids for hours! 87. Mexican Hat Relay – A game that everyone can play – from the littles to the big… everyone can show their moves in this fun and popular Mexican game. 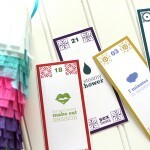 Fun fiesta printables make party planning and preparation easy! 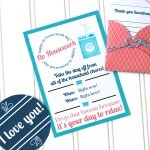 Choose your favorite invites, food labels, activities, and framed decor to make your party pop! 88. Life is a Fiesta – Grab a frame and have a party with this printable! 89. 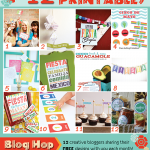 Fiesta Party Kit – This printable party kit includes food labels, party labels, and a framed printable! 90. Fiesta Invitations – Colorful and modern party invitations. 91. Cinco De Mayo Date – Have a fiesta with your friends! This group date night is full of fun awards and delicious Mexican food! 93. 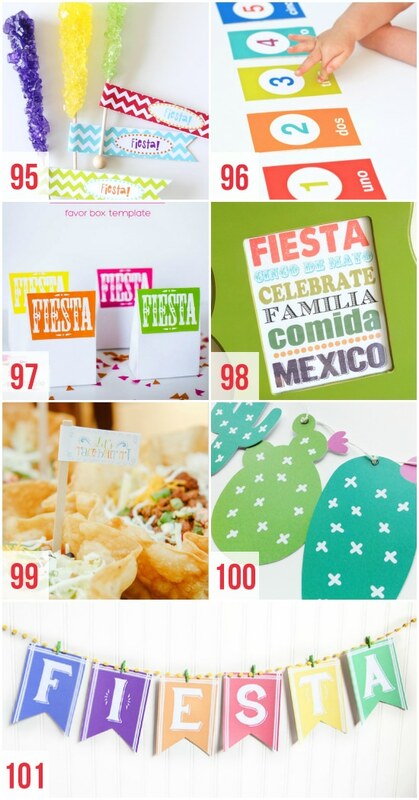 Fiesta Sign – Pair this printable with a pretty banner, and let the fiesta begin! 94. Cinco de Mayo Photo Booth Props – These fun photo booth props will help capture the memories of your fiesta! 95. 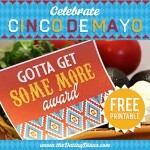 Cinco de Mayo Party – This link is no longer available 🙁 Cupcake toppers, flags, and more come with these Cinco de Mayo party printables! Those rock candy sticks are SO clever! 96. Counting Flashcards – Teach your kiddos to count en español with these fun counting flashcards! 97. Favor Box Template – Want to put something together to say thank you to your party people? These fiesta favor boxes are so fun! 98. Cinco de Mayo Subway Art – This subway art is sure to brighten up your fiesta! Set it up on the food table at your fiesta! 99. Taco Bar Printables – Put together a taco bar and use these taco ’bout it printables to make your party a success! 100. Cactus Garland – Cute cacti of all shapes and sizes make for a fun garland to hang for your party! 101. Fiesta Banner – Bright, colorful party banner! If you love to party and are looking for some more great excuses to throw a party, try out this neat Couples Bunco Party or maybe you want to light up with this Glow in the Dark Party. If those aren’t enough, take advantage of the warm weather with a Splash Party! I am crazy about my husband, Scott and my FOUR cute kids! I spend my days at home--teaching, playing and cleaning up with them! Our favorite place in our home is the kitchen! I love to cook and bake with lots of flavor--and I love having my little helpers in the kitchen, too! Some of my most recent passions are tennis, nutrition, crafting, the great outdoors and photography! All of that food looks SOOOO amazing! 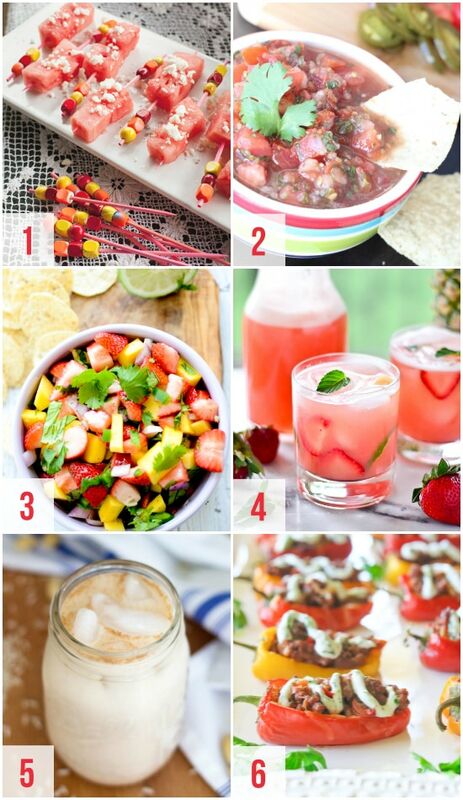 I definitely want to try out #3 – that Strawberry Mango Salsa! Mmmmmmmm!